Abisko has been scientifically designated as one of the best places in the world to see the Northern Lights. Abisko is situated smack in the middle of the Auroral Zone and due to its topography there are very rarely cloudy skies. Coupled with spectacular mountains and lakes Abisko truly is a special destination. It is also around 100kms from the magnificent ICEHOTEL® so we’ve added a night there for good measure!! When I visited Abisko, I returned slightly in awe. This place is wild and it is spectacular. I had visited many parts of Lapland but none had left such an impression on me. There isn’t really anything surrounding the accommodation here, no shops, no bars…. there in lies its beauty. Abisko also has a reputation for being one of the best places in the world to see the Northern Lights and has views of Lapporten (Sami Gate) a very important symbol of Lapland both of which add to the atmosphere. Travelling through South Africa, Swaziland and the beaches Mozambique this tour gives you a mix of the old and the new and great photographic opportunities. Discover the diverse culture and rich wildlife of South Africa and Mozambique with a maximum of 16 person in our custom built full size expedition truck. With over a meter of legroom at each seat sit back, relax and experience the wonders of Southern Africa. We have purpose-built our expedition vehicle, a Mercedes 1820 truck to be one of the best in the business, with exceptional reliability and speed. The truck is designed with our clients in mind: as a result, comfort and space are high on our list of priorities. The truck seats only 16 passengers. A smaller group size means that our tours have less impact on local communities and on the environment. We do not “rack-em, stack-em and pack-em”, as some companies do. Reclining coach-style seats, with over 1.3 metres of leg room, give you the space you need on long days of travelling. Our unique drop-down windows afford exceptional viewing. Above each set of seats is a roof hatch to provide an additional all-round viewing option. There are two storage lockers per set of two seats. One locker is located inside at your feet for your hand luggage/camera gear and contains a box-safe for travel documents, money and other valuables. The other is an outside baggage locker. The truck itself is fully lockable. The linked cab and passenger compartments allow for optimal communication between passengers and the crew, and includes an intercom system for travel information. We provide the services of an expert photographer and digital download facility on all our overland tours, a unique feature making us stand out from the others! One of our crew (normally the Tour Leader) is a full-qualified, semi-professional, photographer who will be available to give advice on photographic (and video) techniques; and will organise “workshops/tutorials” on photographic subjects and techniques (eg landscape, wildlife and bird photography, night shots, close-ups and portraits) to assist our guests to improve their photographic technique. We also provide a laptop computer with multi-card reader for those clients with digital cameras to enable you to download your memory cards and burn those special memories to CD or DVD while on tour. A unique and contrasting combination of two of the most beautiful countries in the world, this Exploration lives up to its name. A unique and contrasting combination of two of the most beautiful countries in the world, this Exploration lives up to its name. It explores the wide open spaces of Namibia, taking in the awe-inspiring dunes of Sossusvlei and the Namib Desert, the stark beauty of Damaraland and the wildlife-rich area of Ongava Game Reserve. Guests then enter another world entirely: the lush green waterways of Xigera in the Okavango Delta, the ephemeral Selinda Spillway linking the Delta and Linyanti, and the Linyanti area itself, famed for its prolific wildlife in a variety of vastly differing habitats. A night at The River Club on the banks of the Zambezi River is a fitting end to a true voyage of exploration. A family safari is such a great way to spend time together and is excellent therapy for everyone! An area of history and legend, offers some of the most excitinggame viewing in Africa. It is a place of exceptional beauty where one can explore therugged, unspoilt African landscapes either in the comfort of open 4-wheel drive vehicles,on a walking safari, on mountain bicycles, or horse back, guided by expert rangers and experienced trackers. In addition to the game experience, Mashatu offers a view ofAfrica, unchanged since the days of early visitors such as Kipling, Selous and artist/explorer Sir Thomas Baines. Historic and archaeological sites abound; notable are the Motloutse Ruins and the Pitsani Koppie sites. The excitement of Mashatu has not changed over time. It is still home to large herds of elephant, prides of lion and cheetah. Along the river courses, huge Mashatu trees provide shade for eland, impala, wildebeest, giraffe and zebra, whilst at night, the bateared fox, African Wildcat and the magnificent leopard search for prey. Some 366 species of birds may be seen. Mashatu Game Reserve proudly provides a refuge for the largest, single population of elephant on privately owned land in Africa. Known as the relic herds of Shashe, these elephants are the last living testament to the great herds that once populated the meandering Limpopo valley. Today, the population on Mashatu Game Reserve alone, is estimated to number in excess of 500. Loisaba is a setting little changed since the Great Rift Valley split Africa in two. This private game ranch is set on 60,000 acres of wilderness. Loisaba is made for adventure: guests enjoy complete freedom to choose how they spend their time … the only barrier is your own imagination. Trek through the bush with camels, mountain bike down the escarpment, raft the Ewaso Nyiro, horseback ride or drive through the wild canyons of the two great rivers that span this vast area. The ranch also owns a micro-light and aeroplane so there are no limits to what you choose to do: heli-camp, then surf the remote sand dunes of the Northern Frontier District, rock-climb the soaring pinnacles thrusting up from the valley floor or just play a little tennis and lie by the pool. A place of deep serenity, Loisaba attracts big game just as it attracts guests: both know they will be safe and well looked after, free to roam unconfined and undisturbed. The Star Beds – four-poster- on raised platforms provide blissful sleep under the vast African sky with only the stars and sky for a ceiling. Even the spa – where pampering is unrivalled – is sensitively constructed and set apart from the other buildings, so that the eternal drama of the bush unfolds before your eyes. Walking wild in Laikipiak Maasai-land is a walking safari holiday through on of Kenya’s best wildlife viewing habitats: the Lewa Conservancy. Combined with the two Maasai Community Conservation areas of Il Ngwesi and Lekurruki, these three areas provide some of the most stunning landscapes in Africa. This area is home to a wide variety of game including the Big Five and over 420 species of bird. This safari is supported by camels, that can be ridden if the terrain allows. For centuries, the naming and classification of living organisms into groups has been an integral part of the study of nature. Aristotle (384BC-322BC) developed the first known method of classifying organisms, grouping organisms by their means of transport (air, land, water). A number of other naturalists followed with other classification systems, but it was Swedish botanist, Carolus Linnaeus (1707-1778) that is considered to be the pioneer of modern taxonomy. In his book Systema Naturae, first published in 1735, Carolus Linnaeus introduced a rather clever way to classify and name organisms. This system, now referred to as Linnaean taxonomy, has been used to varying extents, ever since. Linnaean taxonomy categorizes organisms into a hierarchy of kingdoms, classes, orders, families, genera, and species based on shared physical characteristics. The category of phylum was added to the classification scheme later, as a hierarchical level just beneath kingdom. Groups at the top of the hierarchy (kingdom, phylum, class) are more broad in definition and contain a greater number of organisms than the more specific groups that are lower in the hierarchy (families, genera, species). By assigning each group of organisms to a kingdom, phylum, class, family, genus, and species, they can then be uniquely characterized. Their membership in a group tells us about the traits they share with other members of the group, or the traits that make them unique when compared to organisms in groups to which they do not belong. Many scientists still use the classification system today, but it is no longer the only method for grouping and characterizing organisms. Scientists now have many different ways of identifying organisms and describing how they relate to each other. In general, Linnaean taxonomy uses phenetics to classify organisms. This means it relies on physical characteristics or other observable traits to classify organisms and does consider the evolutionary history of those organisms. But keep in mind that similar physical characteristics are often the product of shared evolutionary history, so Linnaean taxonomy (or phenetics) sometimes reflects the evolutionary background of a group of organisms. Cladistics (also called phylogenetics or phylogenetic systematics) looks to the evolutionary history of organisms to form the underlying framework for their classification. Cladistics therefore differs from phenetics in that it is based on phylogeny (the evolutionary history of a group or lineage), not on the observation of physical similarites. When characterizing the evolutionary history of a group of organisms, scientists develop tree-like diagrams called cladograms. These diagrams consist of a series of branches and leaves that represent the evolution of groups of organisms through time. When a group splits into two groups, the cladogram displays a node, after which the branch then proceeds in different directions. Organisms are located as leaves (at the ends of the branches). To view an example of a cladogram, see Cladistics. Biological classification is in a continual state of flux. As our knowledge of organisms expands, we gain a better understanding of the similarities and differences among various groups of organisms. In turn, those similarities and differences shape how we assign animals to the various groups (taxa). The invention of the microscope in the mid-sixteenth century, revealed a minute world filled with countless new organisms that had previously escaped classification because they were too tiny to see with the naked eye. Throughout the past century, rapid advances in evolution and genetics (as well as a host of related fields such as cell biology, molecular biology, molecular genetics, and biochemistry, to name just a few) constantly reshape our understanding of how organisms related to one another and shed new light on previous classifications. Science is constantly reorganizing the branches and leaves of the tree of life. The vast changes to classification that have occurrred throughout the history of taxonomy can best be understood by examing how the highest level taxa (domain, kindom, phylum) have changed throughout history. The history of taxonomy stretches back to the 4th century BC, to the times of Aristotle and before. Since the first classification systems emerged, dividing the world of life into various groups with various relationships, scientists have grappled with the task of keeping classification in sync with scientific evidence. The sections that follow provide a summary of the changes that have taken place at the highest level of biological classification over the history of taxonomy. Aristotle was among the first to document the division of life forms into animals and plants. Aristotle classified animals according to observation, for example, he defined high-level groups of animals by whether or not they had red blood (this roughly reflects the division between vertebrates and invertebrates used today). The three kingdom system, introduced by Ernst Haeckel in 1894, reflected the long-standing two kindoms (Plantae and Animalia) that can be attributed to Aristotle (perhaps before) and added third kingdom, Protista that included single-celled eukaryotes and bacteria (prokaryotes). The important changed introduced by this classification scheme was the introduction of the Kingdom Bacteria. This reflected the growing understanding that bacteria (single-celled prokaryotes) were very much different from single-celled eukaryotes. Previously, single-celled eukaryotes and bacteria (single-celled prokaryotes) were grouped together in the Kindom Protista. But Copeland elevated Haeckel’s two Protista phyla to the level of kindom. In 1977, Carl Woese extended Robert Whittaker’s Five Kingdoms to replace Kingdom bacteria with two kingdoms, Eubacteria and Archaebacteria. Archaebacteria differ from Eubacteria in their genetic transcription and translation processes (in Archaebactera, transcription and translation more closely resembled eukaryotes). These distinguising characteristics were shown by molecular genetic analysis. In 1990, Carl Woese put forth a classification scheme that greatly overhauled previous classification schemes. The three-domain system he proposed is baseed on molecular biology studies, and resulted in the placement of organisms into three domains. Talk about charisma. The basking shark – the second largest fish in the world, after the whale shark – can grow up to 11m long and weigh 4.5 tons. It swims with its enormous mouth agape, filtering 2,000 cubic metres of sea water per hour in order to trap plankton in its gill rakers. This summer, The Wildlife Trusts are offering the opportunity to see basking sharks off Britain’s west coast. Colin Speedie, a leading marine conservationist and the skipper of the yacht Forever Changes, will take volunteers out to help collect information on basking sharks, as well as monitoring the effects of climate change on marine species. Speedie has been studying basking sharks since the 1980s. “During 2007 we will be re-surveying known basking shark hotspots and other new areas to establish their distribution and habitat use,” he says. 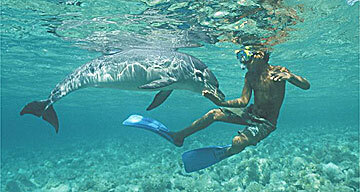 As well as the sharks, you might also see whales, dolphins, turtles and a wide variety of seabirds. There’s something magical about a wild animal that comes to you voluntarily. Watching dolphins is exhilarating, especially when they leap and dive alongside your boat. The Moray Firth is an excellent spot to see them – around 130 are thought to live in the area. Dolphin-watching boat trips leave from the village of Cromarty. On dry land, the best spot to head for is Chanonry Point on the northern side of the Firth. Twice a day, fish surge through the channel and are ambushed by waiting dolphins. Wordsworth called them “earth-born stars”. Rather more prosaically, a balmy summer’s night lit by glow worms makes you feel as if you could be in the Med. Glow worms are actually beetles and it is the females who do the glowing. The key to their fluorescence is a protein called luciferin. Adding oxygen and water produces a chemical reaction that results in a pale green glow. The female can switch her light on and off by increasing or decreasing air to the luciferin layer. Females glow to attract males, who have larger eyes to help them pick potential mates. The National Trust runs glow worm walks at some of its sites. If you’re looking for sheer cuteness, you can’t go wrong with seals. Both the grey and common species frequent our coastline. From Blakeney you can take a boat three miles out to the tip of Cley Beach. In July, the samphire is as lush as the grass at Lord’s and interspersed with the purple, papery flowers of sea lavender. This is one of the most popular spots in the country for common seals to rest after a few days’ fishing. Although largely solitary creatures, seals do gather in large numbers at certain sites: at Blakeney there are sometimes as many as 600. Summer is a good time to see them because they’ve just had pups. Their mothers bring them here after they’ve been weaned; the youngest are about four weeks old. Intermingled with the common seals are grey ones. The key to telling them apart is that the common seals look rather like Labradors, with their round faces and snub muzzles. The Great Orme is a limestone peninsula with views of the sea and Snowdonia; the south-facing slope is covered in butterflies. Silver studded blues are tiny – about the size of a thumbnail – but there are half a million in the 60 hectare site. When the sun comes out they open their startling blue wings and flutter in small clouds, the males vying with each other to impress the females. The peak season is late June through July. They have an unusual life cycle: the caterpillars exude a sticky substance that attracts ants, which in turn milk the caterpillars and help protect them from predators. Red kites are a rusty colour, with a wingspan of almost 2m. This beautiful bird was pursued by game keepers and egg collectors and, by 1903, Britain’s kites were down to just five breeding pairs. In 1989, conservationists brought kites here from Spain; there are now 3,000 of them. At Gigrin, meat is put out every day, so you can get within a few metres of the birds – close enough to get a good look at those impressive talons. Orchids can be irresistibly fascinating, with a whiff of the illicit about them. We have 56 species of native wild orchid in the UK and the warm chalk downland of Kent is one of the best places to see them. Park Gate Down, a reserve managed by Kent Wildlife Trust, has 10,000 orchids growing in a tiny area. You’re likely to see fragrant, greater butterfly, late spider, musk, pyramidal, common spotted, early purple, lady, as well as the very rare monkey orchid. The latter is only found in three sites in the whole of Britain and, when you look closely, the flower really does look like a gangly spider monkey. This nature experience is not so much a case of seeing, but listening. Ainsdale is one of the best places to hear natterjack toads calling. Although smaller than the common toad, this little beast is the loudest amphibian in Europe. In spring and summer, the males call to attract mates and their chorus of croaks can carry for a mile. Natterjacks are nocturnal, so one of the best ways to hear them is to go out at night. It’s a magical experience standing by a pond, the jet-black surface shimmering with the moon’s reflection, the sea whispering on one side as all around toads sing their throaty songs. The toads have fairly flat bodies that are warty brown, olive or grey (the males can lighten or darken their skin in order to camouflage themselves better), with a distinctive yellow stripe that runs all the way down the middle. Males have nuptial pads: hard patches on the inside of their forefingers that they use to grip the female during mating, and large vocal sacs. They’re not very good at jumping, only doing it if they are alarmed. Surprisingly, they’re poor swimmers and can drown in deep water. 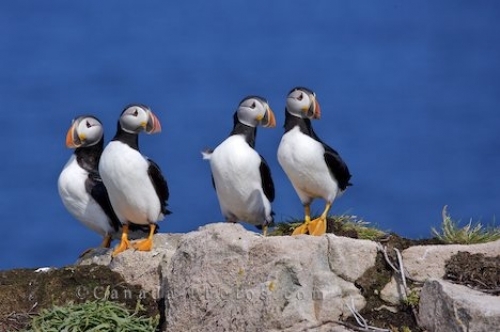 Who doesn’t love puffins? There’s something comical about their plump bodies, parrot-like bills and dapper, plumage. Puffins nest in large colonies on cliffs with grassy slopes, where they dig burrows. A puffin normally lays one egg in its burrow at the end of May; the chick hatches 43 days later. At this time of the year chicks will still be reliant on the parents for food. Their main diet is sand eels, the over-fishing of which has led to a decline in puffin numbers. On the Farne Islands, though, they are doing well: there are around 55,000 pairs, and you’ll be able to get quite close. The islands are one of Europe’s most important seabird sanctuaries, home to more than 20 different species, including eider ducks and four species of tern – some of which will dive-bomb you , so wear a hat. Ospreys feed exclusively on fish. Their underparts are white, with dark brown above, and their legs have thorny hooks to help them hang on to fish. With a wing span of 150cm, they’re impressive birds, especially when hunting. At this time of year the adults will be feeding their young. Ospreys are endangered, because they were hunted by fish farmers and have been affected by pesticides. There are now more than 130 pairs in Scotland, and we finally have the first English-born ospreys for more than 150 years. It’s cute and it’s cuddly. And in 30 years, campaigners say, the koala will be extinct. But this emblematic animal has a curious history – and its fate is mired in politics. When south-eastern Australia was consumed by bushfires in February, one image shut out all others. Nearly 200 humans might have perished, but a koala had been saved: videoed in a blackened landscape imbibing thirstily from the water bottle of a volunteer firefighter, Sam featured in newspapers from the New York Times to the Sun, and became a hit on CNN, YouTube and a website created by her veterinary carers. According to the Australian prime minister Kevin Rudd, she was the subject of widespread comment at the G20 summit in London in April this year, and he issued a personal tribute to this “symbol of hope” when Sam died six months later. “It’s tragic that Sam the koala is no longer with us,” Rudd said, just restraining himself from decreeing a state funeral. Political leaders, however, appropriate symbols at their peril. A fortnight ago in Canberra, representatives of the Australian Koala Foundation (AKF) took a long and determined campaign for better protection of the creature to the government’s “threatened species scientific committee”, following a request for a review of the animal’s status by environment minister Peter Garrett. The foundation presented what they say is definitive evidence of a sharp decline in koala numbers due to habitat destruction and disease. Its message was stark: the koala would be extinct “within 30 years”. Hits on its website instantly doubled, and concerns were expressed about the impact on Australia’s tourist industry: polls consistently show the koala to be the country’s most popular animal with visitors. In the AKF’s chief executive Deborah Tabart, meanwhile, Rudd faces an implacable and outspoken critic, one who will now be dogging his steps at next month’s Copenhagen climate change conference. Rudd may have been nice about Sam the koala, but Tabart does not think Rudd is doing enough for the species; she describes him as a “bureaucrat who hides behind policy and writing documents”. The koala, she mutters darkly, “has many powerful enemies”. It has certainly had its detractors. The koala features in fossil records as far back as 25 million years ago, and has an honoured place in aboriginal creation myths, but when Gerald Durrell described it as “the most boring of all animals”, he was far from the first to do so. The koala is assuredly a creature of leisure. It has the smallest brain proportionally of any mammal, sleeps most of the day, and dedicates much of the rest to chewing gum leaves. 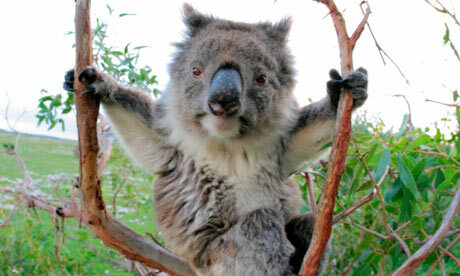 The first description published in England 200 years ago, in fact, introduced the koala as the “New Holland Sloth”. In his Arcana; or The Museum of Natural History (1881), the naturalist George Perry was severely censorious of the koala’s “sluggishness and inactivity”, and thought its “clumsy appearance” was “void of elegance”. Nor was the koala then prized for cuddliness, being widely hunted for its fur from the 1870s, and provoking relatively little interest overseas. The first specimen to make it to England met an untimely end in the office of the superintendent of the Zoological Society, asphyxiated by the lid of a washing-stand that fell on its head. The koala’s installation in national favour owes much to eager exercises in anthropomorphism in the early 20th century, first in cartoons published in the legendary nationalist periodical the Bulletin, then in children’s tales such as Norman Lindsay’s The Magic Pudding (1918) and Dorothy Wall’s Blinky Bill (1933). Lindsay offered Bunyip Bluegum as a koala of culture, with boater, bowtie and walking stick, while Wall’s Blinky was a marsupial of mischief, dressed in knickerbockers and bearing a knapsack, although sufficiently patriotic to join the army during the second world war. If it was considered inadequately industrious for the 19th century, the ­ koala was exquisitely suited to the cuteness-conscious 20th. Indeed, it is appropriate that the AKF’s case is accented to the environmental pressures the koala faces in Rudd’s home state of Queensland, where it is the faunal emblem, and has always had political claws. It was in Queensland that the koala was the subject of Australia’s first concerted environmental campaign after the state Labor government, in response to pressure from trappers who had denuded koala populations to the south, proclaimed an open season on the animal in August 1927. The trappers had their way, slaughtering and skinning no fewer than a million koalas, but the Labor government paid the price, being swept from power at the next election. Australia’s first three fauna parks, set up in the late 1920s, were then dedicated to koalas. Researching all this for his book Koala: The Origins of an Icon (2007), biologist Dr Stephen Jackson was astonished by the ardour he encountered. “You read now what was being published then, and you think: ‘Wow! These people really went off.’ It’s almost the beginning of the conservation movement in Australia, because it mobilised people as never before.” And although nobody has since posited a Queensland koala equivalent of the Curse of Gnome, there is some evidence for it. Seventy years after that pioneering koala campaign, for example, federal tourism minister John Brown famously dismissed the animals as “flea-ridden, piddling, stinking, scratching, rotten little things”; he left politics soon after following allegations he had misled parliament over a tender submitted by a contractor. The 1995 state election was then dominated by a Labor government plan to drive a major roadway through a key koala habitat. An apparently unassailable majority dwindled unsustainably when Labor lost what became known as the “koala seats” in Brisbane Bayside. Oddly, Rudd – then chief-of-staff to the premier of Queensland – was mixed up in the row over that koala habitat. Far from being new, Beeton observes, disease is a perennial problem in the koala community. The Chlamydia organism, which finally carried off Sam, may be present in as many as half of Australia’s koalas – just as it is also present in about a third of humans. There is clearly much argy-bargy to come. The AKF’s prospects will depend on its ability to use global concerns to influence domestic policies; for Australians, the koala reposes, at least at the moment, on a list of “things-to-be-concerned-about-had-I-the-time”. Statistics that are public, however, include those of widespread land clearing in Queensland until its cessation in January 2007, after a decade in which up to 700,000 hectares of habitat was being destroyed annually under the influence of property developers and resources companies – a reckless abandon whose environmental effects are still little understood. In this sense, Sam the koala was an ironic representative of her species, survivor of a calamity amply publicised and readily understood; far greater ecological damage on Australia has been inflicted by easy government acquiescence. Is it OK to swim with whales and dolphins? Travel companies in many countries offer the chance to get up close to whales and dolphins by swimming alongside them in the sea. But there is growing concern that in some areas heavily targeted by commercial swim tours, there may be a long-term impact on the health and wellbeing of the animals. However, the Whale and Dolphin Conservation Society (0870 8700027, wdcs.org), which runs its own whale-watching holidays, has decided to not include swim tours on its holidays. It recommends only boat-based holidays, with a naturalist on board and a boat handler who has taken one of the voluntary codes of conduct, such as the Dolphin Space program (dolphinspace.org), or the WiSe (Wildlife Safe) scheme (wisescheme.org). Subscribe to our newsletter 'Wild and full of Life"